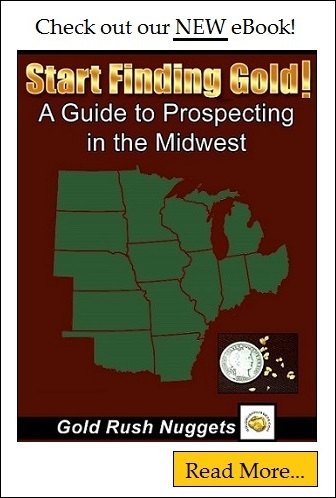 Like the other Midwestern states in the U.S., there is placer gold present in scattered amounts throughout the state of Minnesota brought down from receding glaciers from the last ice age. Glacial deposits do not generally accumulate gold in enough quantity to be valued by commercial endeavors, but smaller scale gold prospecting is a present and growing hobby within the state. In addition to the glacial gold, past discoveries of low-grade lode deposits in the northern part of the state caused a few short lived gold rushes, but were eventually abandoned due to low yield. Recent lode discoveries in the past decade have caused a huge interest in recent years by commercial mining companies. For recreational gold prospectors, Minnesota has plenty of opportunities and several active clubs to help you get started pursuing gold. There have been reports of placer gold in Minnesota since the mid 1800’s. The first documented report of gold was at the Zumbro River near Oronoco, Minnesota. For a short while there was much interest in these gold deposits, but it was quickly discovered that gold concentrations were not rich enough to warrant serious mining. Nonetheless, this area will still worthy of investigation by prospectors today. Historically, the area that received the most attention for mining was the region around Lake Vermilion, where short lived gold rush occurred in 1865. Prospecting was done throughout the eastern part of the lake and the town of Winston City quickly sprang up after ore samples were discovered showing the presence of gold. Processing the ore profitably turned out to be a burden on the early prospectors of the region, and interest in gold was soon overshadowed by Minnesota’s rich iron potential. Anywhere around Lake Vermilion, Trout Lake, Soudan, and Ely in northern Minnesota are worth checking out. Near the border with Canada, a short lived gold rush occurred at Rainy Lake near present day International Falls. Several mines popped up in the summer of 1894, but like other discoveries in the Minnesota profitability was an issue. The gold was locked up in ore, and the gold recovered did not cover the cost of production. On a commercial scale, Minnesota’s rich iron ores have far overshadowed the other mineral resources in the state. As one of the richest iron producers in the entire world, much of the past centuries mining endeavors have been focused on this rich resource. In the past decade, several mineral exploration companies have discovered new deposits of extremely rich ore in the far northeastern part of the state, with core samples indicating high concentrations of gold, nickel, copper and platinum group metals. These new discoveries show extremely high potential, and it will be interesting to see how these resources develop. Although it is unlikely that small scale prospectors will have the investment capital needed to work these deposits, it goes to show that there are always new discoveries to be made.